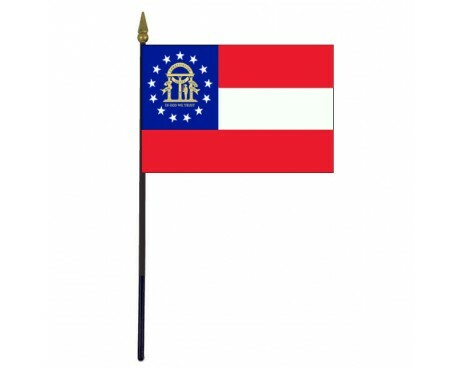 Georgia State Stick Flag - 4x6"
The current state flag of Georgia has been in use for less than twenty years, but it follows in the footsteps of many older designs. Most of the Georgia state flags shared common design elements that can be traced back to the first flag of the Confederate States of America. The modern flag of Georgia has a single white stripe between two red stripes and a blue canton, and it shares those features with almost every old Georgia state flag. The canton holds a ring of thirteen white stars that surround a golden representation of the state's coat of arms, which includes an arch supported by three pillars and guarded by a colonial soldier with a drawn sword. The thirteen stars represent the thirteen colonies that came together to form the United States of America, which included the colony of Georgia. The arch represents the state's constitution, while the pillars that support it represent the three branches of the state government. The armed guard that stands below the arch represents the state's willingness to defend its constitution and the rights that it provides. 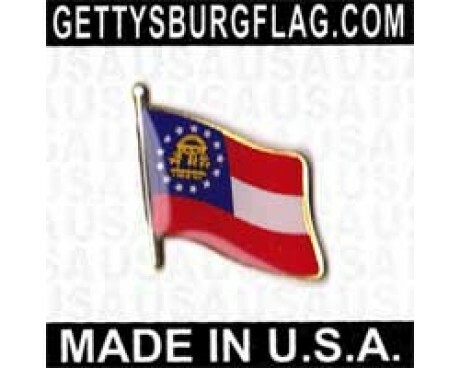 Most Georgia state flags have featured three stripes and a blue section along the hoist. Those elements came from the first flag of the Confederate States of America, which included the state of Georgia. The Georgian government adopted its first state flag in 1879, and it was based on the Confederate flag in order to memorialize the Georgian citizens who died during the Civil War. The original flag had a blue bar that ran along the entirety of the flag's hoist and did not feature an emblem. A variant of the state seal was added to the flag in 1902, and new variants were adopted in 1906 and 1920. The flag changed dramatically in 1956. The new flag replaced the stripes with the Confederate battle flag, which was popular at the time but eventually became highly controversial. 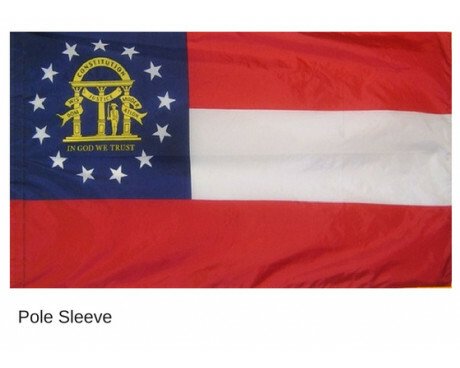 The old Georgia state flag was replaced with a new flag in 2001. The 2001 design had a solid blue field that displayed the state's seal in the center above a line of historical flags. It was highly unpopular, and the modern flag replaced it in 2003. In 1733 Georgia was founded by the British in 1733, and named after King George II. It became a state after the Revolutionary War in 1776, and seceded from the Union in 1861. It was re-admitted in July 1870. 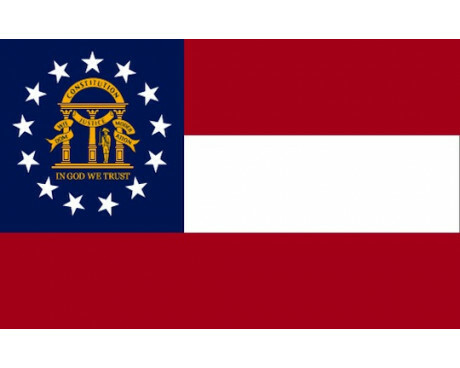 Georgia is one of those states whose flag recalls the Confederacy,(Which used a version of the Stars and Bars during the Civil War). The Stars and Bars were the first Confederate flag. In a report of March 4, 1861, it was recommended by the “"Committee" on a Proper Flag for the Confederate States of America. This committee indicated that the flag should be "of a red field with a white space extending horizontally through the center, and equal in width to one-third of the flag, and the red spaces above and below to be of the same width as the white, and the union blue extending down through the white space, and stopping at the lower red space. Then in the center of the union a circle of white stars corresponding in number (seven) with the States in the Confederacy". This flag was used during the Civil War with the state seal within the seven stars, by the Georgian troops. In 1879 the new flag was similar, but without the seal and stars, and the blue canton extended to the full depth of the flag. On July 1,1956 the Stars and bars of the old flag were replaced by the Confederate Battle Flag. Georgia is located south of the Savannah River, and north of Florida with an Atlantic sea-coast. In 1732 it received a Charter, and was made a royal province in 1752. 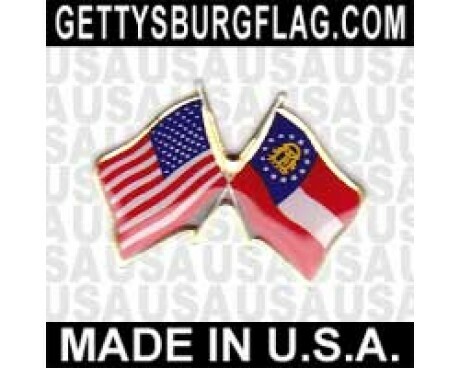 Georgia became a state in 1776, and was ratified by the Constitution on January 2, 1788. On January 19, 1861 it seceded and was re-admitted on July 15, 1870.